Halloween Card Screensaver with its inhabitants, no doubt, will be very useful to decorate your computer\'s desktop in anticipation of the upcoming Halloween. Halloween Card Screensaver with its inhabitants, no doubt, will be very useful to decorate your computer\'s desktop in anticipation of the upcoming Halloween. 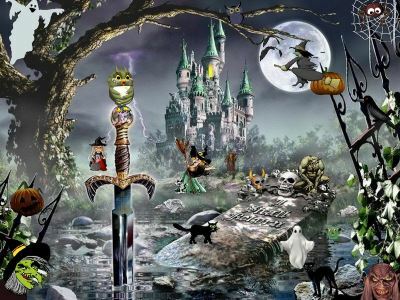 Witches, bats, spiders, pumpkins, skulls, ghosts and mysterious mystical creatures - what a holiday of Halloween without them? Install this colorful free Halloween screensaver and get opportunity to observe the developments in this extraordinary mystic night right on your computer monitor. AuraScope is a kaleidoscope-style screensaver that draws beautiful patterns that glow and softly fade away. AuraScope uses mathematical formulas to come up with a hypnotic display of complex images that never repeat. It's time for you to take that vacation you deserve and escape from it all. Relax in style on your own tropical island and listen to the gentle ocean waves lapping on the beach. Install this screensaver and say "hello" to the classical Disney toons characters! You will see on the screen of your PC: Mickey mouse and Minnie mouse, Goofy, Pluto, Donald duck, Daisy, Winnie the Pooh and friends, Beauty and the Beast and friends. Find yourself in a cozy room with a hammock. The wind playing with the canopy door. A window overlooking the enchanting sunset over the ocean. A large aquarium with elegant fish, swaying plants and rising bubbles. Can life get any better? Turn your computer desktop into an incredible 3D underwater world. Watch schools of near-realistic quality 3D fish swim among bubbles within beautiful underwater backgrounds.